I find myself drawn to homes with gallery walls. I love how they convey a relaxed collected feeling. 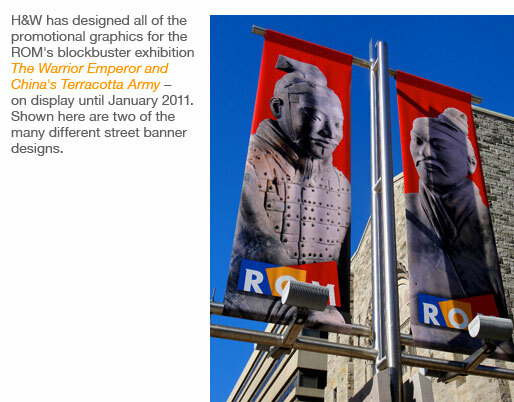 If you’re thinking you don’t have any fabulous art to work with — think again. It’s all about the mix. Take a painting you inherited and combine it with an etching from e-bay, a piece of metal sculpture and some black and white photography and you’re well on your way. 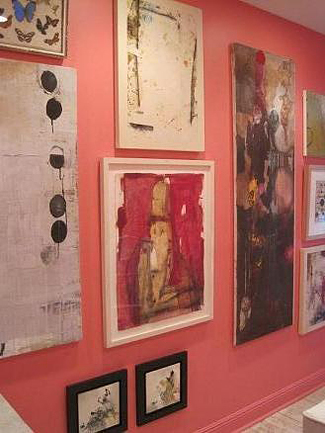 This is one of my favourite gallery walls by talented Canadian interior designer Christine Ralphs. She designed this wall in her home using a variety of images, some purchased very inexpensively. The black and white theme pulls together pieces that complement each other, without looking overly curated. 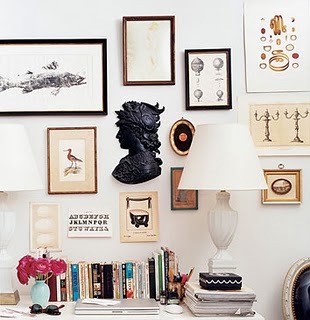 In Canadian House and Home editor Suzanne Dimma’s home, she’s also mixed black, natural wood and gold frames. What a welcoming space. Each piece seems to tell a story. While visiting the offices of Hambly and Woolley in Toronto, I discovered this fresh gallery wall in graphic designer Barb Woolley’s office. 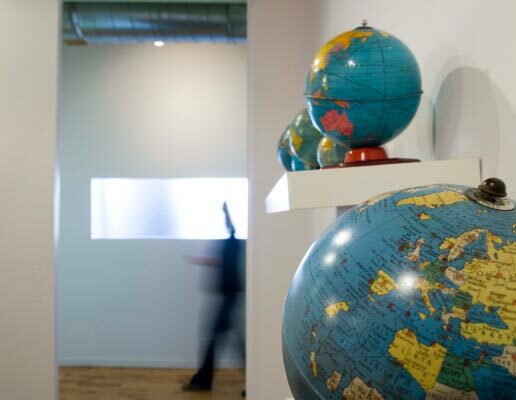 Barb has impeccable taste and it shows throughout the company’s cool loft space. Her use of initials is charming. 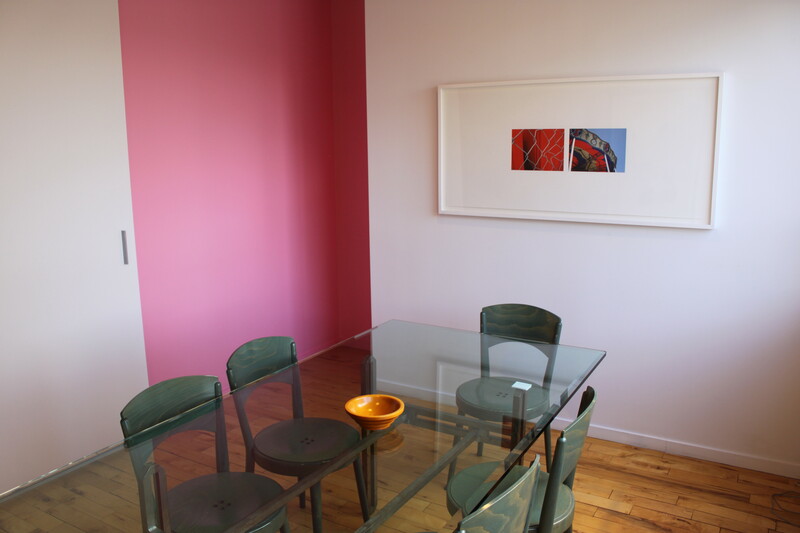 At Hambly and Woolley, Barb and her husband artist Bob Hambly even have a gallery wall in their lunch room! Talk about inspiring creativity. 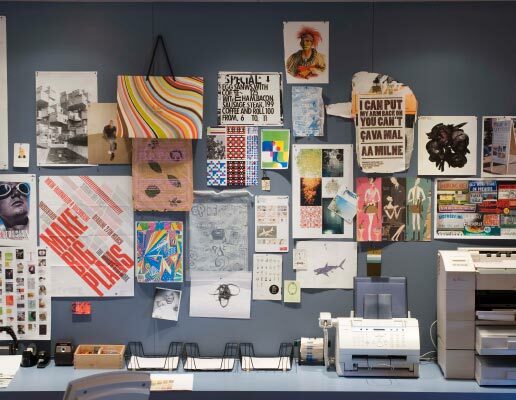 I visited artist/illustrator Alanna Cavanagh’s studio home earlier this year. 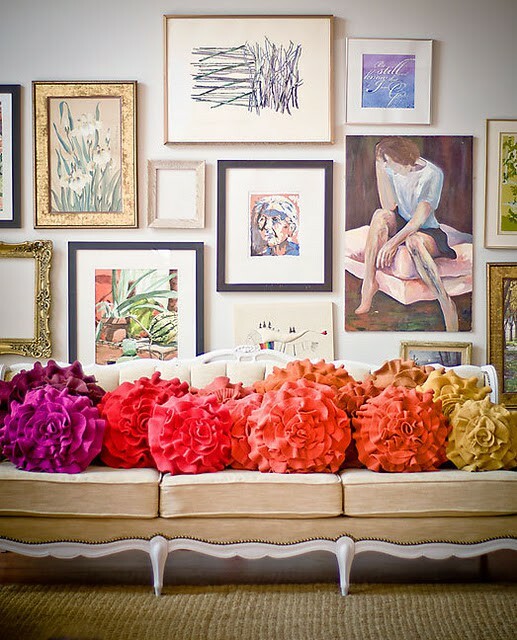 I couldn’t take my eyes off the gallery/salon wall she created in her living room. Alanna used some of her own work (love her men’s brogue shoe), but added a variety of pieces and textures to create an interesting vibe. 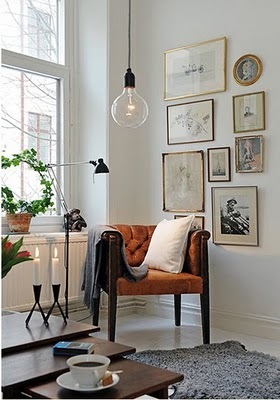 I like the eclectic feeling in this space. 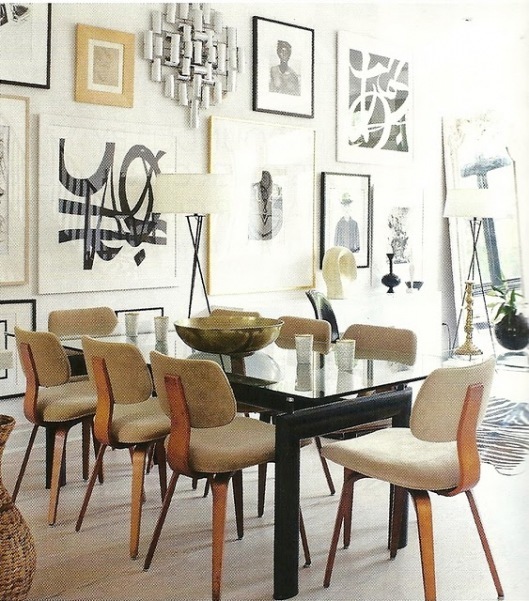 The mix of textures from the furniture to the art makes it fresh and interesting. 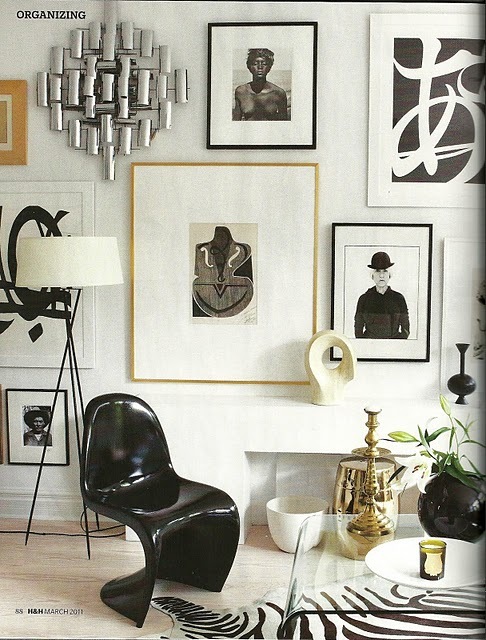 Again, I see that metal on the wall – it seems to be a key ingredient in many of the best gallery walls. Frames of different thicknesses and sizes really work. Here’s another vignette that beckons you to take a closer look. I do love dark moody walls but have to say white is one of the best choices for a gallery wall, as it lets you mix so many different colours and shapes without looking busy. So how do you get started? I think it really depends on the space, the ceiling height and the effect you’re going for. Some people lay their art on the floor and play with the arrangement. You can easily cut out newspaper or Kraft paper templates of each piece — taping them on the wall to see if you like the effect. Spacing between the frames usually varies from 2 to 4 inches – you’ll know what’s right when you stand back and squint. There really are no rules if you like the effect. I tend to start with the largest piece in the middle and fan out from there, adding and subtracting until I’m happy with the look. Ideally if I’ve left enough room, I can keep adding pieces over time. 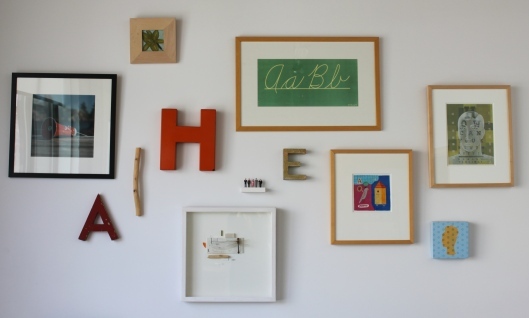 The most creative gallery walls are truly personal — combining paintings with photography and personal treasures — anything from a framed mitten to an antique key. If you love it and it means something to you — use it. 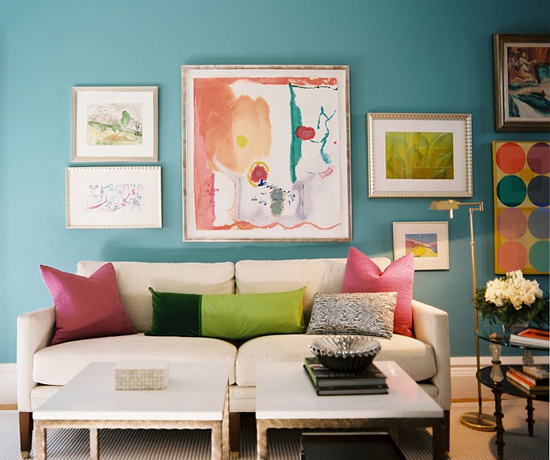 Shake off the formality of symmetrical arrangements and design your own gallery wall. I’d love to see what you come up with. The couple launched their business 20 years ago. Their offices are separated by a rolling door that’s rarely closed. Bob admits,”I look for Barb’s opinion more than she looks for mine. I’m always running things by her.” It’s a partnership that works for both of them. Barb says, “I couldn’t do it without him. We support each other in everything we do.” They’ve been married for 24 years. 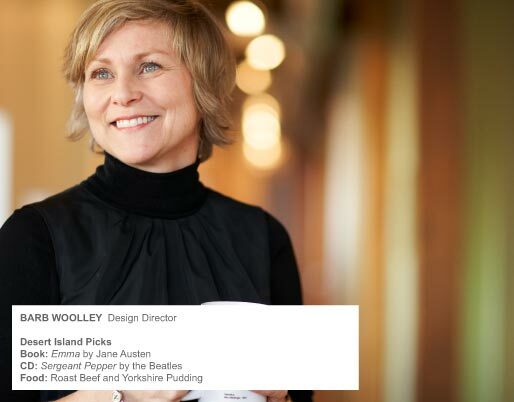 The company with the pig and sheep logo now has over 350 awards and an enviable client list. Its founders have a busy and well-rounded life. I dropped into their light-filled offices in the heart of the fashion district to learn more about their winning approach to design, creativity and life itself. 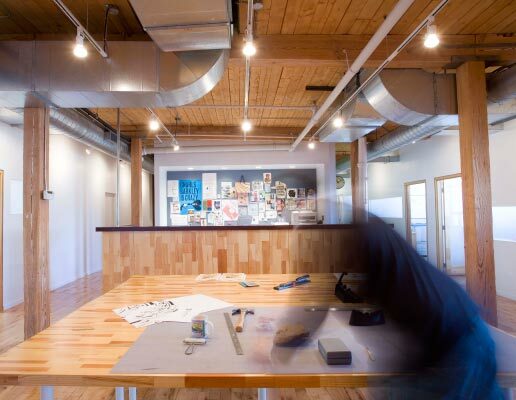 Perched on the top floor of a renovated loft building near the CN Tower, the airy offices of Hambly & Woolley Inc. are quiet and serene. The designers and their team may be working to meet deadlines, but there is a zen-like feeling in the air. A whimsical collection of art in Barb’s office. 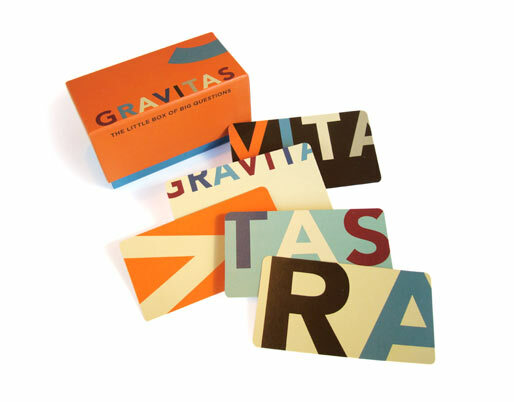 The office walls are painted white with hits of colour – orange, pink, green, blue and chocolate-brown (taken from their logo) highlighting small niches throughout the space. Staff are encouraged to pin-up anything graphic that inspires them. 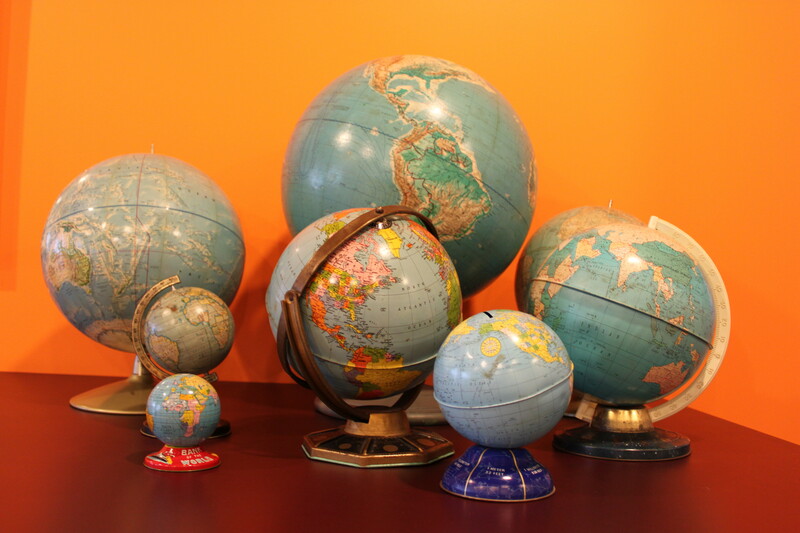 Barb’s collection of close to 50 globes is scattered in groupings throughout the space. 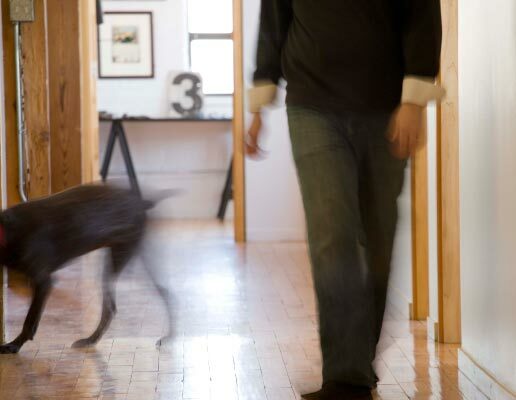 A few of the firm’s designers even bring their dogs to work. 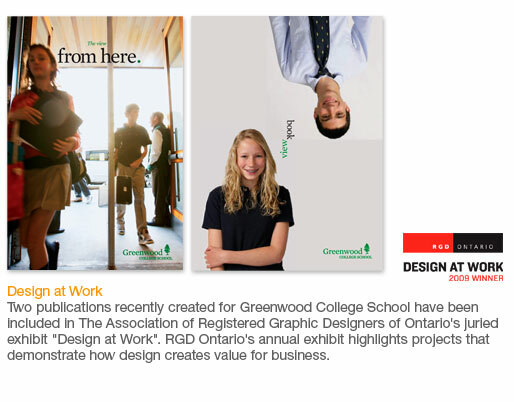 Despite the relaxed attitude that permeates the office, H&W is a serious player, juggling accounts as varied as the The Royal Ontario Museum, The Ontario College of Art and Design, Harry Rosen and the Toronto Zoo. 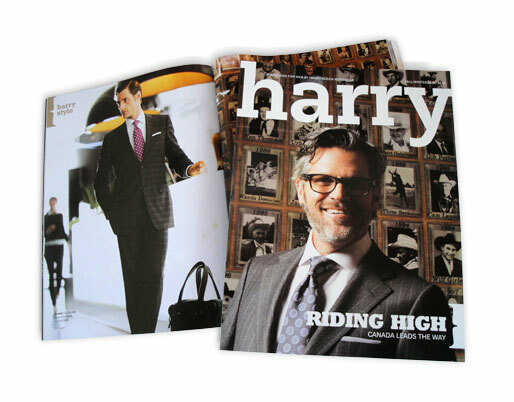 Since H&W opened its doors in 1990, it has done work for 881 different clients. Barb has a degree in Graphic Design from the Ontario College of Art and Design and Bob, who grew up in Ontario, graduated from The University of the Arts in Philadelphia. Today, they both make a point of teaching and mentoring younger designers. They’re always looking for ways to make work interesting and appealing to their staff. One way they do this is making sure everybody is the author of their own work and gets recognized for it. They also haven’t lost sight of the need to have fun while they’re working. Bob recently started giving talks at local colleges and universities. 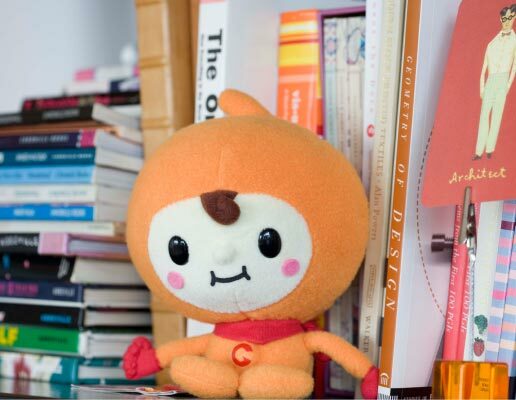 I was intrigued by the title of one of them — Curiosity: The Designer’s Secret Weapon. 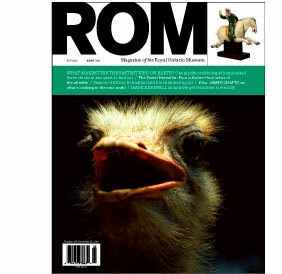 Taking a closer look at curiosity – how it can be nurtured and encouraged – rather than feared and under-valued, is fascinating whether you’re designing a visual identity package or an interior. Take risks – “Challenges can be successes or failures; you tend to learn more from your failures. You don’t have to be a designer to connect with his message. He’s even addressed a group of students and alumni from the University of Toronto Rotman School of Management. For Bob, one of the ways he expresses his creativity is through art. He says, “my goal is to do more and more of it.” For 12 years, his brush and ink illustrations appeared in the “Lives” feature on the back page of the Sunday New York Times Magazine. His illustrations have also appeared in Entertainment Weekly, Time, InStyle, House and Garden and Martha Stewart Living magazines. In his office, Bob keeps a cabinet full of objects he’s found or restored. 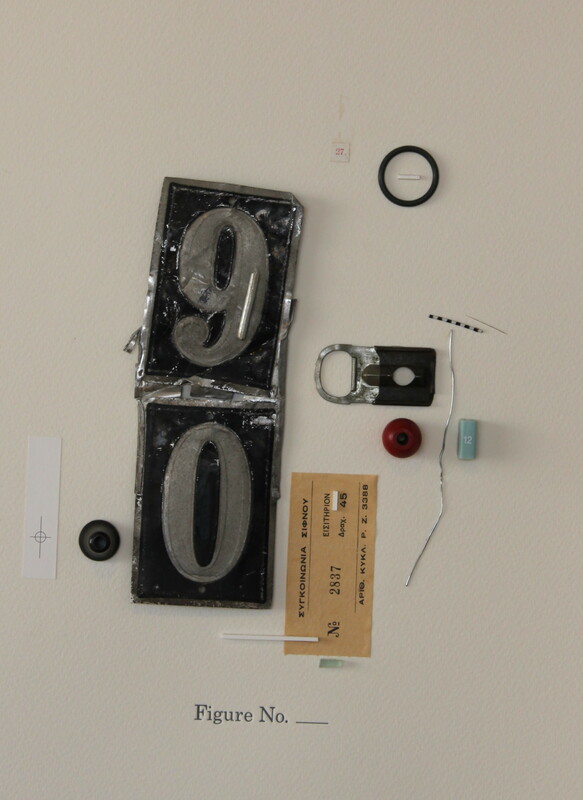 He often creates collages incorporating these pieces and other natural materials. 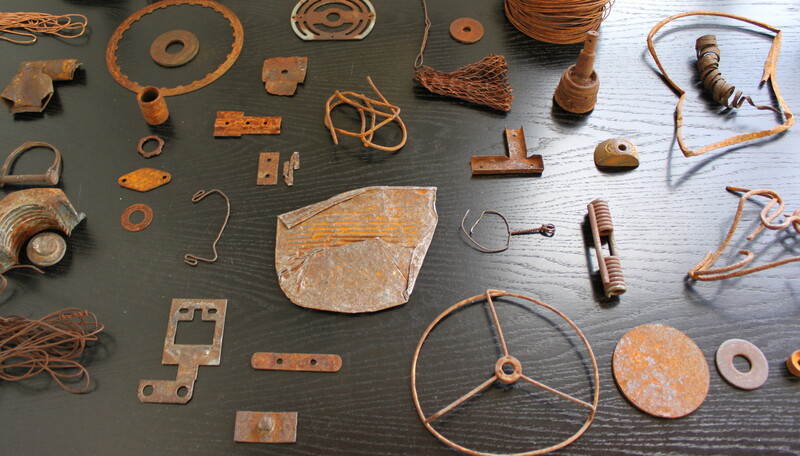 A few of the found objects Bob finds inspiring. 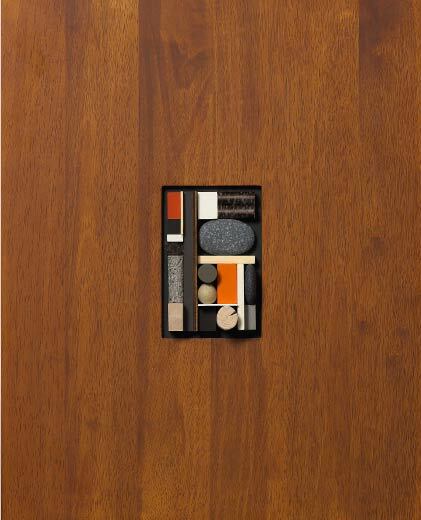 Assemblages of wood, stone and other found materials allow Bob to explore texture, contour, colour and pattern. He surrounds them with large borders of natural wood. 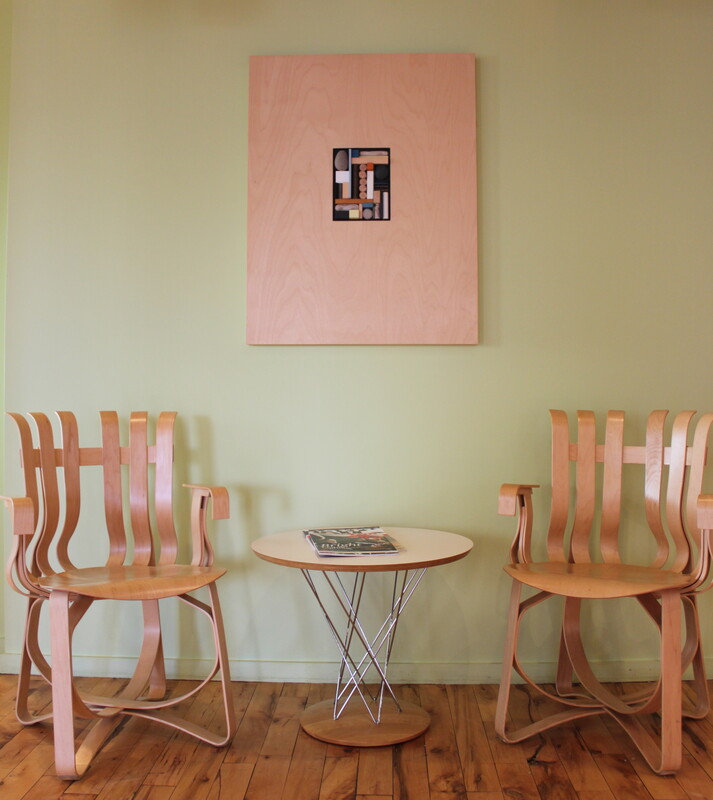 The H&W lobby features Bob’s work and an airy mid-century modern vibe. 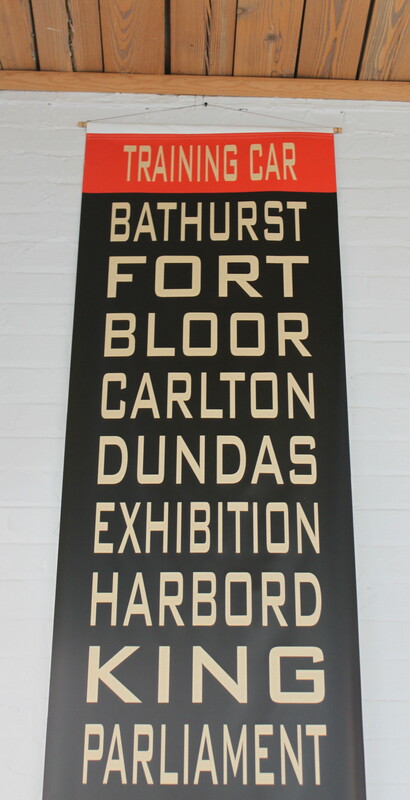 A scroll of a vintage Toronto transit sign that hangs in Barb’s office. Even the lunchroom has a gallery wall of art. Who knew that gloves found on the road could make such a striking collection. Bob has dated and recorded where he found each work glove. Walking through the company’s offices, it’s easy to see that H&W has a thing for orange. It’s a colour associated with happiness and enthusiasm, which is why the partners named their monthly newsletter after this feel good hue. You can read more about it here. For many years, the company sent clients an annual pig-and-sheep-themed umbrella, pencil set or pair of socks, but three years ago the partners decided to do something more meaningful. 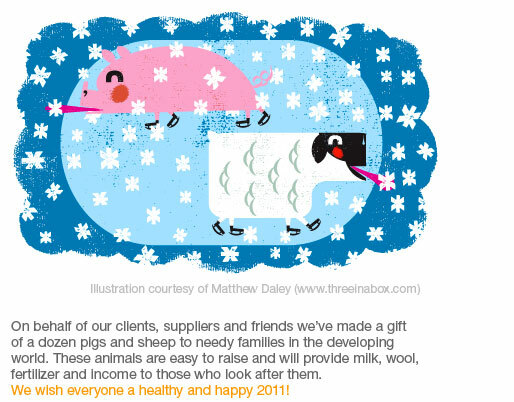 They now make a gift of a dozen pigs and sheep to needy families in the developing world. At this point in their careers, Bob and Barb choose to work with clients who understand their approach and trust them to deliver. Their client roster remains varied and interesting. About a year ago, Barb and Bob completed a project close to their hearts. Working with architect Cindy Rendely, they built a weekend retreat in the Northumberland Hills. It’s a modern urban barn, complete with a studio for Bob to work on art projects. Their daughter Emma is now in university — she joins them when she can. They’re still putting the finishing touches on the interiors and landscaping, but I’ve seen photos and it’s spectacular. Bob’s family once owned a Coca-Cola franchise and had one of the best collections of soft drink memorabilia in North America. 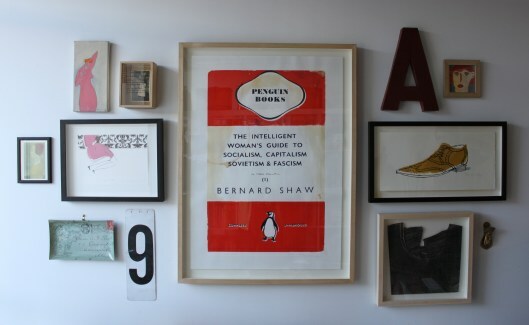 Most of it has been sold, but he kept a circular red sign that now hangs in their living room amidst iconic modern treasures. It was Barb’s idea to give it pride of place and they both love the reaction it gets from visiting friends. To learn more about Hambly & Woolley Inc., check out the company website here or Bob’s personal website here. 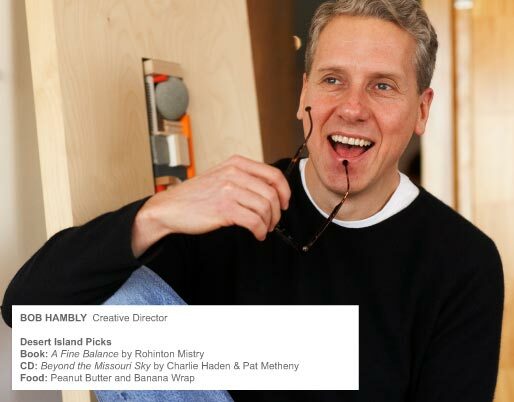 Photos and images courtesy of Hambly & Woolley Inc.